Welcome and thanks for visiting the Fat Stupid Ugly website. 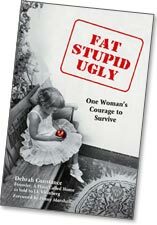 Read excerpts from Fat Stupid Ugly: One Woman’s Courage to Survive, find out what people are saying about the book, and order books for yourself and your friends. Learn more about Debrah Constance and J.I. Kleinberg and see Debrah’s touring and interview schedule. Photos! We’ve also supplied the answers to Frequently Asked Questions, links to important places and services related to Debrah’s story, as well as recent press releases. NEWS! Fat Stupid Ugly just released in Japanese! ©2004-2007 Debrah Constance and J.I. Kleinberg. All Rights Reserved.